Is this Greece's national Dish? As March 25th happens to be the anniversary of Greek Independence from the Ottoman Turk Occupation which lasted nearly four hundred years, I thought I might place a pebble on the monument to Greek freedom, and offer my own thoughts on the Greek national dish since there seems to be some ambiguity. In my mind, none of the three dishes mentioned on Wikipedia are candidates for Greece’s national dish. Many of you will already be familiar with my choice, and many of you will have at least heard of it. 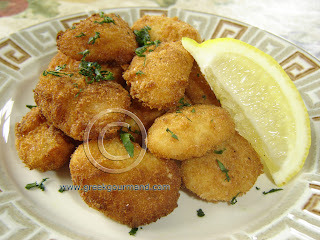 The true National Dish of Greece is called kleftiko (in other words, ‘of or belonging to, the Klephts’). Who are Klephts and what is their dish? Kleftiko is basically lamb meat seasoned with lots of oregano, lemon juice and wild greens, then wrapped in fig leaves and cooked at a low heat for many hours, sometimes even entire days, in a sealed clay oven that was usually buried or otherwise hidden from sight. The Klephts, from whom it derives its name, were bands of Greek brigands who were never subjugated by the Turks. They roamed the high-country and mountainsides of Greece and Cyprus while the Turkish occupiers settled in the plains, towns, and cities. Entire swathes of the mountainous Greek countryside, particularly in the southern Peloponnesus were largely autonomous zones controlled by the various local Klepht bands. The name Klepht is derived from the Greek root word klepto which means ‘to steal’. Stealing is how the Klephts managed to maintain themselves and usually at the expense of Turkish settlers in the towns and plains. But, lowland Greeks were also fair game for these raiders who descended rapidly from the mountains and stole what they needed or desired, then just as quickly disappeared back into the rocky defiles and up into the craggy mountainsides. Livestock was an especially important booty for the Klephts, particularly sheep and goats, as meat made up the bulk of their diet. So, the kleftiko that the Klephts enjoyed was usually stolen, which gives the term kleftiko a double meaning i.e. as the ‘meat of the Klephts’ and simply ‘stolen meat’). As time went on and the power and influence of the various Klepht bands and their leaders grew, they raided with greater impunity, and were a constant thorn in the side of the Turkish Occupation authorities. Not surprisingly, it was among the Klephts that the first stirrings of the patriotism and national consciousness, which eventually led to the Greek war of Independence, were nurtured and passed on for generations. Most of Greece’s modern heroes from the War for Independence which began on March 25, 1821 are Klepht captains. This dish is one of the true lamb classics of Greek cookery. The lamb turned out so tender we could literally cut it with a spoon. If you like lamb, you'll love this dish. 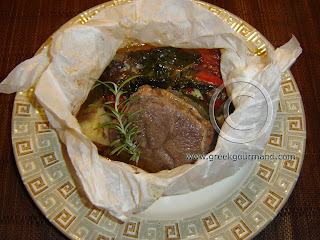 Wrapped in parchment paper with vegetables, herbs, spices, and Graviera cheese and slow cooked in the oven for two hours, the lamb is then served exactly as shown in the photo at the top - parchment paper and all! This dish is the ultimate in Greek comfort food... a truly rustic meal. The Arni Exohiko bundles before going into the oven to be slow cooked. 1. Place cubed lamb in a large bowl and sprinkle generously with salt and fresh ground pepper, make sure to mix the meat to ensure an even spread of the salt and pepper. 2. Cut six parchment paper squares (fold the parchment paper into triangles before cutting to ensure that each piece is perfectly square) and in the center of each square make a small bed of spinach. 3. 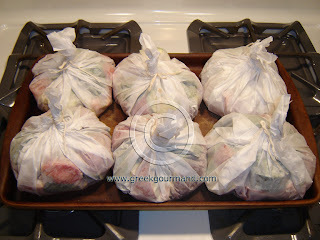 Place a sixth of the lamb cubes (3 cubes) on top of the spinach on each of the parchment squares. 4. Put one whole garlic clove and one bay leaf in the centre of the lamb cubes on each square and then sprinkle the meat liberally with oregano and rosemary. 5. Sprinkle one sixth of the grated Graviera cheese overtop of the meat on each square. 6. Place two potato wedges, one onion wedge, one tomato slice, one sixth of the carrot slices and one piece of red pepper on top of the meat on each square, then sprinkle the vegetables lightly with salt and pepper and drizzle one tablespoon of olive oil overtop of each pile of ingredients. 7. Pull the corners and edges of each parchment square together to fashion a pouch, then twist them together and tie them closed tightly with string. 8. Arrange the pouches on a rimmed baking sheet/pan and place in preheated oven at 325 degrees. Cook for 2 hours. 9. Remove the baking sheet from the oven and allow the pouches to stand for 5 minutes. Serve each pouch on a dinner plate or shallow bowl. Untie the string and carefully open the parchment paper to eat. *Note: Parchment paper must be at least 38 cm. (or 15 in.) wide. A square piece at this width will allow you to draw in all the ends and tie the package tightly and completely shut. Gigantes Tiganiti … Pan-Fried Giant Beans make an excellent appetizer dish. Since time immemorial beans and legumes have figured prominently in regional dishes throughout Greece. Dried Gigantes beans (pronounced YEE-GAN-DES) are a staple of Greek cookery and can usually be found in Greek specialty shops and bakeries, or most well-stocked supermarkets around the world. Also referred to as Elephant beans, Gigantes are about 1 inch long or roughly twice the size of conventional lima beans, and are a variety of runner bean. Cultivated largely in north central Greece, these beans can be prepared and served as an appetizer, as part of a salad, or as a main course. Indeed, this bean is so popular in Greece that five varieties of Gigantes/Elephant beans have been recognized as Protected Designation of Origin (PDO) / Protected Geographical Indication (PGI) produce by the European Union. The extraordinarily meaty and buttery texture of this extra large bean has served to make them a ubiquitous menu offering in Greek tavernas and restaurants the world over. However, the version you will usually find in such eateries is one where they are baked in a rich tomato sauce. This particular recipe is popular on the Cyclades Islands and makes for an excellent appetizer dish. 1. Soak the beans in water overnight to re-hydrate them. Drain the water and rinse the beans well before cooking. 2. Add beans to a pan with enough cold water to cover the beans by about 1 inch or so. Add salt to water and bring to a boil then simmer for ten minutes. 3. Drain beans, rinse them with cold water and return them to the pan. Add fresh cold water to the pan along with some salt and once more bring to a boil, then lower heat to medium-low and simmer for 25-30 minutes until beans are tender. Remove from heat, drain water and set the beans aside. 4. Beat milk and egg well in a small bowl. Sift the flour into another small bowl and add salt and pepper to taste. Put the breadcrumbs into a third bowl. 5. Heat oil in pan. *NOTE: You need to ensure that there is enough oil in the pan to almost, if not completely, cover the beans when they are added to the pan. My suggestion would be to use a smaller pan which will require less oil. 6. Flour the beans in small batches then dip them in the egg mixture and then cover them with breadcrumbs. Fry them in small batches and be ready to turn them over quickly in the pan to cook both sides evenly - stay on top of them when frying as they don't require very long and you don't want them to burn. Remove beans from the oil when a uniform golden brown outer colour is achieved. This is one of the quintessential Greek dishes and can either be cooked as a vegetarian meal or made with the addition of ground beef. This version is vegetarian and Lenten friendly for those of you who may be avoiding meat or fasting. This particular recipe was my grandmother’s and she used to make it in a wood-burning oven which made all the difference in flavour. Variations on this dish include stuffing tomatoes and other vegetables; however, this specific recipe works best with peppers and zucchini. 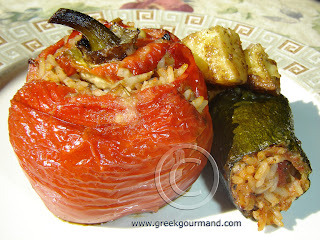 Years ago, here in Canada, before Greek food became synonymous with fast food fixes like Souvlaki and Gyros, all of the Greek restaurants on Danforth Avenue (Toronto’s Greek town) served stuffed vegetables along with other “magirefta” or ‘ready-cooked’ meals. Of course, this was back in the 60’s and 70’s when Greek eateries catered largely to a Greek immigrant clientele who were familiar with such dishes. Back then, when you walked into a Greek restaurant you did not usually order from a set menu. Instead, you were invited to peruse a number of ready-cooked meals that were displayed behind glass on a steam table that oftentimes ran the length of the restaurant and contained everything from baked giant white beans in tomato sauce (Gigantes), to braised sheep’s head (Kefalaki Arnisio). Of course, Souvlaki was also available in those days, but the overall variety of Greek food in those restaurants was greater than it has been since. As time passed and the Greek immigrant community started to disperse and to assimilate within the wider Canadian milieu, Greek restaurants began to struggle as their client base was steadily eroded. When Greek food in Toronto finally broke out of its ghetto origins and into the mainstream, it did so largely by catering to the fast food side of the food service industry which was in ascendancy and appealed to a wider cross section of Canadian society. Within this context, Greek restaurateurs were forced to compete with more familiar cuisines by catering to a North American palate. 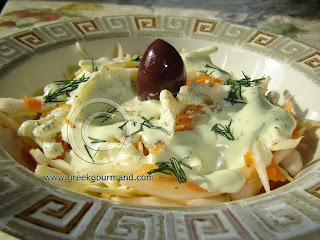 So, unfortunately, meals like this one slowly disappeared from Greek restaurant menus. They were replaced by the cooked to order Greek meals known as “tis oras” or ‘at this time’, which consisted largely of grilled or fried items like Souvlaki and Calamari, along with an assortment of “mezedes” or ‘finger foods’ like Spanakopita, and cold dips like Tarama and Tzatiziki. At home, we continued to eat the traditional meals such as this one, and only rarely had Souvlaki. To this day, after having worked in and run Greek restaurants both here in Toronto and in Greece, I prefer meals such as this one and only rarely do I eat Greek fast foods like Gyros or Souvlaki. Interestingly enough, this meal and others like it are now being re-discovered and re-interpreted by advocates of health conscious or 'fusion' cooking. For myself, I prefer to stick with this proven original which has been a part of my family’s diet for generations. I hope you will give it a try and perhaps start a new eating tradition of your own. 1. Wash all vegetables well. 2. Peel, pulp and strain the tomatoes to remove the seeds and set aside. 3. Using a sharp knife cut into the tops of the peppers and continue cutting around the stem to create a “cap” which will be used to close the top of the stuffed pepper. Using your fingers or a small spoon, remove the seeds and as much membrane as you can from within the peppers without cutting through the walls or bottoms. Sprinkle a little salt and sugar inside each pepper and set aside. 4. Cut the zucchinis in half and remove the ends from each, and then slice a thin “cap” from each end and set aside. Then, using a mellon baller or a small spoon, proceed to hollow out the zucchinis without going through all the way to the bottom or piercing the walls. Sprinkle a little salt inside each zucchini half and set aside. 5. Cut potatoes into small cubes and set aside. 1. In a large frying pan, sauté the onions in half of the olive oil until golden. 2. Add strained tomato pulp and juice to the pan, mix with onions and cook for a few minutes. 3. Add the rice along with the other ingredients including the zucchini pulp, and mix well in the pan for a few minutes over a moderate heat. 4. Fill each of the peppers and zucchini halves about 2/3 of the way full with the mixture using a teaspoon. Note: do not fill all the way to the top as the rice will expand while cooking and will overflow or break through the skins of the vegetables. 5. When stuffed, place the peppers in rows and the zucchini halves standing upright among them in a deep walled baking pan. Add the cubed potatoes into the empty recesses of the pan and pour in a small amount of water, essentially enough to cover the bottom of the pan, about a 1/4 inch or so. Place the “caps” back on top of the peppers and zucchini halves and pour the rest of the olive oil overtop of everything. Sprinkle some dry bread crumbs on the top of each capped pepper and zucchini half and sprinkle salt and pepper over potato cubes. 6. Cover pan (with a cover or aluminum foil) and bake at 350° F (190° C.) for 1 hour, then uncover the pan and bake for an additional 15 minutes or until the “caps” on the peppers and zucchinis have browned, the water has been cooked off or absorbed, and the peppers are tender. Serve one pepper and one zucchini half along with a few potato cubes per serving. As much as possible, I use only authentic Greek ingredients for all my recipes as I know it makes a difference in the taste of the final product(s). Any style of pasta noodle can be used for this recipe, though I recommend using something like rigatoni, penne, and farfalle as opposed to linguine or spaghetti type shapes. I alternate between rigatoni and a Greek pasta type known as “makaronia kofta” or “cut macaroni”, which is short-cut tubular pasta (“tubetti” in Italian). 1. Bring salted water to a boil and put pasta on to cook (cooking time will vary depending on the noodle but should be around 12-15 minutes). 2. Pit and chop the Kalamata olives into pieces (not too small). 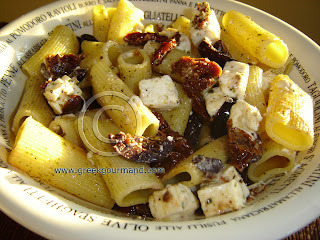 Also, chop the sun-dried tomatoes into ribbons, then cut the feta cheese into small cubes. 3. Prepare and heat the extra-virgin olive oil in a large sauté pan. 4. 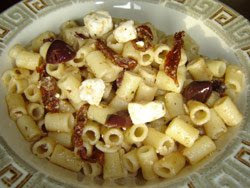 Drain the pasta well once it has cooked and add it to the heated olive oil in the sauté pan, then add the feta cheese cubes, chopped black olives, and ribboned sun-dried tomatoes and heat through by tossing repeatedly for a couple minutes until you see the cheese just starting to melt. Season with oregano and ground black pepper, give it a couple more tosses in the pan and serve hot. When making social calls to friends and family, Greeks invariably show up toting a ribbon-tied box from a local Greek bakery. Nine times out of ten, the box will contain some of these cookies. My earliest childhood memories of welcoming visitors and paying visits include these biscuits. In my reminiscences, they always conjure up images of good times and wholesome relationships. 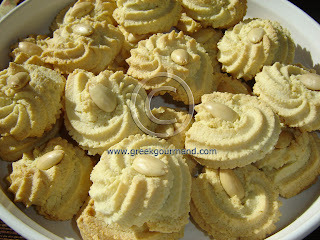 Amygdalota biscuits are a staple product in any Greek bakery and they are wildly popular. They are the perfect accompaniment to a Greek coffee and an ideal anytime treat. If you are not already familiar with these cookies, then you will be in for a pleasant surprise should you decide to mix up a batch. The ingredients are simple and the process is straightforward and rewarding – both visually and gastronomically. 1. Add the blanched almonds and the semolina to a food processor/blender and puree/grind until very fine. You will likely need to stop the processor a few times to scrape the sides of the bowl so that the mixture is thoroughly mixed and very finely processed. 2. Beat the two yolks and one egg white very well with a mixer in a large bowl, then add the sugar, the almond puree, and the orange blossom water and mix well with either a dough hook (stand-mixer) or a wooden spoon. 3. In another bowl, whip the remaining egg white until nice and stiff with peaks and then incorporate it thoroughly into the almond puree mixture. The hard: Prepare a large/oversized piping/icing bag by coating the interior of the bag with butter to ensure some lubrication as the biscuit mixture is pretty dry. Ensure that the largest tip is affixed to the end of the piping bag and proceed to fill the open end with the cookie dough (likely all collected in one mass at this point). This is where the “hard” part begins because squeezing the cookies out of the piping/icing bag will require a little bit of elbow grease, so if your hands are weak I recommend the easy way as outlined below. Now, when you do work the mixture down to the point where you can squeeze the dough out onto a sheet of parchment paper on a cookie tray, the trick is to create small rosettes by drawing an inward spiral, just one complete circle but with the ending point in its centre where you will twist the bag to cut off the cookie, and then move on to the next. When you have squeezed off all you can, lightly press a whole blanched almond into the centre of each rosette to cover the cut-off point. The easy: break off small pieces of the dough, no bigger than a golf ball (though preferably a touch smaller), and roll them into balls between your palms. Placing the balls on your bake sheet press an almond into the centre of each ball in such a way as to effectively flatten the lower hemisphere of the biscuit. These biscuits will lack the visual flair of those done the “hard” way, but the taste and texture will remain the same. 5. Once your cookies are laid out (approximately 28-30 pieces from the measurements given above), place the cookie sheet/tray in an oven preheated to 350° F. Bake for approximately 20 - 30 minutes or until the cookies are starting to turn slightly golden. The aim here is to dry out the outer layer and bottom of each biscuit but to retain whatever little moisture is still left within, so stay on top of them after the 15 minute mark of baking as you do not want to dry these out too much. 6. When removed from oven leave to cool for at least one hour, though I prefer these biscuits on the following day. Important: To maintain the inner chewiness of these biscuits, it is a good idea to store them in sealed air-tight containers or wrapped in cellophane/plastic. Panta Kala (Always Be Well)! Revithosoupa… Chickpea soup, easy to make, healthy and hearty. One of the reasons I believe Greek food is among the healthiest cuisines on the planet, is a simple recipe like this… The earthy goodness and nutritional value of this dish makes its own case. For those of you who are vegetarians or for those who are trying to cut back on meat consumption, this dish provides a heart healthy and hearty alternative to more common legume/bean soups. Canned or dried chickpeas can be used for this recipe. If you are going to be using dried chickpeas, make sure to wash and soak them overnight so as to soften them up and prepare them for cooking. 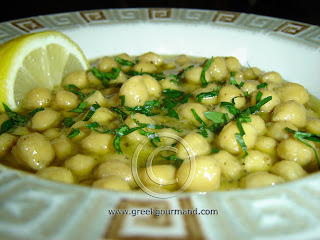 Also, make sure to rinse the soaked chickpeas well before using them (this applies to the canned varieties as well). 1. Heat oil in a saucepan and sauté onions until soft. 2. Add drained chickpeas, salt, pepper, saffron*, and water to cover chickpeas by about 1 inch (2 ½ cm.). Cover and simmer for 2 hours, stirring occasionally, until chickpeas are soft and tender. Note: you may need to add some more water if you have to cook them longer than 2 hours as previously dried chickpeas generally take longer to completely cook through. 3. Serve hot or cold with lemon juice. Garnish with chopped parsley and a lemon wedge. Can it get any easier than that?! This Greek dessert is one of my all-time favourites as it is not too sweet and very, very easy to make. 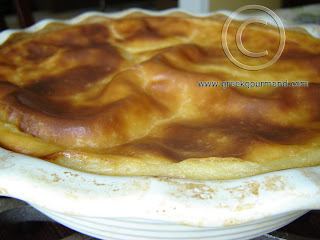 Although similar in many ways to the dessert known as “Galaktoboureko”, this pie is not meant to be syrupy, nor does it require any phyllo for an outer shell as the mixture congeals and forms its own shell when cooked, as can be seen in the photo above. To view the video recipe for this dish, click here. 2. On stovetop, bring milk almost to a boil in a saucepan, and then add butter, sugar and semolina making sure to stir continuously over the heat until a thick crème is formed, then turn off the heat and let stand for a couple minutes to cool slightly. 3. Beat the eggs and add them to the thickened mixture and incorporate them well with a whisk. 4. Butter/oil the sides and bottom of a pie dish or other high-walled oven pan and pour in the thickened mixture, then place in the oven and bake for approximately 1 hour until the top has browned (see picture), then turn off the oven but do not remove the pie for another 15 minutes. Once the pie is removed from the oven, let it stand to cool for a couple hours and serve it topped with icing sugar/cinnamon. Each year with the approach of Lent, Greeks all over the world prepare for the Easter celebration by fasting for a forty day period. The greater part of this fast consists in abstaining from meats and animal by-products including dairy foodstuffs like eggs, milk and butter. Coincidentally, this fasting period (called Sarakosti or 'forty days') arrives at just the right time to help us shed some of the extra weight we have put on during the winter months! Of course, it is always a challenge to come up with appropriate foods that are both tasty and varied, but thanks to the wide range of Greek gastronomic specialties this period can be anything but monotonous. 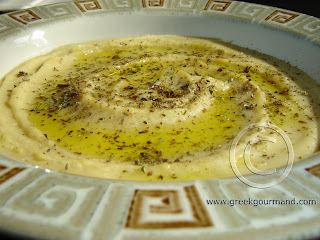 Fava is essentially a yellow split-pea purée and it is especially popular on the Greek islands, particularly Santorini (or Thera) and Crete. On Santorini, fava is an important element in that island’s cookery, and it is eaten year round as an accompaniment to the most varied meals. Fava is an excellent vegetarian source of protein, and also contains significant amounts of thiamin, pantothenic acid, folate and iron. 1. Wash the split peas well in a basin with lots of water. 2. Put split peas in a pot and add water to cover the split peas by about ½ an inch or so. 3. Add onion and extra virgin olive oil. 4. Bring pot to a boil and then simmer for approximately 40 minutes, stirring occasionally. 6. When the split peas have thickened and are fully cooked, remove from heat and purée until smooth with a wand blender or other food processor. Refrigerate or let stand for several hours so the fava congeals. Serve with some lemon juice, olive oil, and a generous dose of oregano overtop. The trick to eating this dish is to mix up the fava with the oregano, olive oil and lemon juice before eating, and try it with warmed Greek pita bread!